Well, hello and how do you do. 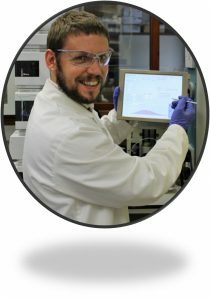 My name is Ryan Skilton, and I am the research scientist at a company called Vapourtec. We manufacture equipment for flow chemistry. We really wanted to tell everyone a bit more about what we do and how we do it, so I have started to write this blog. Hopefully you will enjoy it and find out a little more about how we go about things. First things first, who am I? Well, I did undergraduate and PhD in chemistry at the University of Nottingham, where I specialised in automated optimisation in continuous flow. I joined Vapourtec as research scientist in 2016, and I run the laboratory here, conducting our own research and development experiments in flow as we develop new products, and do our best to support our customers when they need it. I’m also often at conferences, demonstrations to customers and help out our team of service engineers with training new users. Recently, I’ve been doing quite a bit of work with photochemical reactions and it was while working on our application note 59 (available here) that I serendipitously stumbled on the content of application note 60. App note 59 is a library synthesis of a range of different compounds, mostly derived from either maleimide or uracil. I was carrying out a [2+2] photocycloaddition with ethene, and frankly everything was going along very well. Almost all of the compounds in the library were reacting as expected, and I was getting really good conversions to the cyclobutyl adducts. Then I saw the analysis of 5-fluorouracil. Oh dear. Missing from the NMR were the characteristic peaks of the cyclobutyl ring, but also missing were the characteristic peaks of 5-fluorouracil… something had taken place, but I had no idea what. Happily, our NMR expert and consultant organic chemist Dr Roger Moses was on hand (metaphorically, he was actually in Cornwall), and after a bit of literature mining, found a reference from 1984 that indicated I was carrying out a photochemical hydration. Once I had finished the library application note, I came back to 5-fluorouracil and this odd reaction taking place instead of the cycloaddition, even with a significant excess of ethene. So, start at the start, I suppose; repeat the initial experiments from App. note 59 to confirm my results. Happily, I found the same thing happened, so I continued to explore the chemistry a little further by firstly taking away the ethene, then turning the lamp off. As one might expect from a photochemical reaction, turning the lamp off had a fairly disastrous effect on the conversion, so I thought it probably best to turn it back on. Just to be sure, I tried a range of conditions thermally as well, but alas with no success. After a bit of work with our HPLC, I’ve been able to follow the reaction chromatographically; although because of vastly different chromophores I can’t quantify anything, I can at least identify complete and incomplete conversions. This approach, backed up with the occasional NMR has enabled me to find some high throughput conditions quickly, and I am very close to running a gram-scale synthesis, isolating and purifying, then I can publish the note. This project has really been lovely to work on, all I have had to do is dissolve the reagent in water with a drop of acetone, shine the light on it in the UV-150, and the product even crashes out once it has been sat for a few minutes.